None of the major conservation organizations list them among endangered or threatened species; however, Lepus othus is described in "Mammal Species of the World" as rare and decreasing in range and numbers. Significantly larger than the snowshoe hare, the Alaska hare, also known as the tundra hare, is one of the largest species of hares. During summer, Alaska hares have a dusky brown coat, grizzled with gray, darker on top of head, with white under parts. Their nose and mouth are marked with cinnamon or buff hair. They have a white ring around dark eyes and they have dusky ears washed with gray and tipped with black. During the winter their coats turn all white with black-tipped ears. Their ears are short compare to most hares. Ear size in hares plays a large part in thermoregulation, and small ears in a cold environment will prevent heat loss. Their hind feet, like the snowshoe hare, are large and fur covered to aid in movement over snowy terrain. Alaska hares are basically solitary, except during late winter while there is still snow cover and the hares retain their white pelage. These aggregations, when groups of 20 or more have been observed, coincide with the mating season. Conception occurs in April, and they have a gestation period that lasts about 46 days. Most Alaska hares breed in their first year. Young are born in late May or early June in an unlined depression called a form, or in the shelter of thick willow or alder brush. They young will be fully grown by mid-August or September, and weaned in about 5-9 weeks. Litter size is larger than most other hares, generally being between 5–7 (average 6.3) young. The larger than average litter size is thought to be due to the fact that, in contrast to most hares, the Alaska hare only gives birth to one litter per year. Young Alaska hares, called leverets, are born as all hares are, with their eyes open and a full coat of hair. Leverets weigh 2 ounces at birth and can walk as soon as their hair dries. They are born with a darker pelage than adults, with a black tinge to their fur. Alaska hares are herbivores. They eat mainly green plants in summer and woody vegetation of shrubs (bark, twigs, and shoots) in winter and spring. They will also eat crowberry fruits. They are most active when foraging at dawn and dusk. 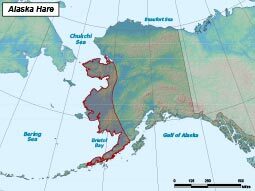 Alaska hares are found in western Alaska from the Kotzebue Sound area in the north to the tip of the Alaska Peninsula in the south, including the Seward Peninsula, the Alaska Peninsula, and most of the western coast of Alaska. Alaska hares prefer Arctic and maritime tundra habitat and can be found in alluvial plains, coastal lowlands, alder thickets, sedge flats, and wet meadows. They use basically open tundra, but use brush where it is available when they are not foraging. The Alaska hare is rare and is perhaps decreasing in range and numbers, although population size is known to fluctuate and little to no population studies are currently ongoing. The last reported population high was on the western Seward Peninsula and in the Yukon-Kuskokwim Delta region in the 1970s. Throughout the hare’s southern distribution on the Alaskan Peninsula, high population numbers have not been reported since winter 1953-54 (Schiller and Rausch 1956). Habitat loss associated with human communities and subsistence harvest may pose threats to the Alaskan hare. Mining on the Seward Peninsula is increasingly fragmenting and altering tundra habitat. 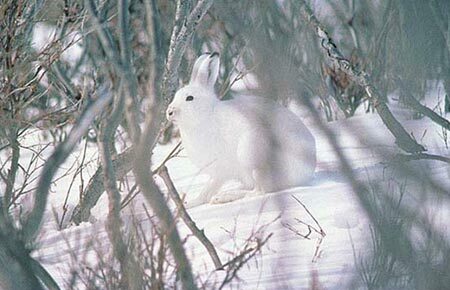 Potential interference competition with snowshoe hares may pose threats also (Svendsen 1990, Klein 1995). Southern populations are thought to be effected by habitat loss and climate change. Reproductively active by their first year. Breed in late April with a gestation period of about 46 days and give birth to litters of 5–7. Lepus othus is quite similar to L. arcticus and L. timidus. Molecular data suggest these three are conspecific, while morphological data separate them. All are found in different geographic regions.